Sony Pictures Releasing and Sony Foundation Australia have partnered to help raise much-needed funds for Sony Foundation’s Children’s Holiday Camp Program. 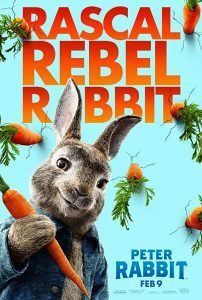 Special advance screenings of the live-action/ animated comedy adventure PETER RABBIT will be held at select cinemas nationally to support this unique respite program for children with special needs. This year marks 20 years Sony Foundation has funded the Children’s Holiday Camp Program which empowers high school and university students to take on the responsibility for the care of children with special needs over four days, allowing their families to have valuable time off. Every year over 1,100 students from 46 schools and 4 universities around the country along with 600 special needs children benefit from the experience that comes at no cost to these families. Funds raised will ensure the program continues to grow and offer this extraordinary opportunity to more families that need it. PETER RABBIT is in cinemas from March 22.